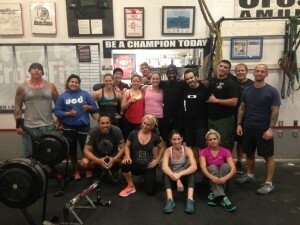 Welcome to CrossFit Amundson! We are currently enrolling new Athletes on a case by case basis depending on our current membership at the time of inquiry. We are World renowned for providing an atmosphere that focuses on education and inspiration. Weather you are new to physical fitness or an Olympic Athlete, you are guaranteed a challenging and supportive learning environment. Schedule a Meeting with a CrossFit Amundson Coach to review the Welcome Packet, complete a Waiver, and Registration Form. Complete 1 month of CrossFit LIGHT. You can now register and pay on-line for CrossFit Amundson. We are offering 3 month and 6 month pre-paid membership packages, which include the Point of Entry Program and Yoga. To get started, please e-mail Info@CrossFitAmundson.com or call 831-332-1187. You can also visit the links below for specific information on pricing, our schedule and our location.